This program began 11 years ago as a peer-to-peer suicide loss survivor support program by an AFSP chapter and today, has nearly 500 trained volunteers, and is available all over the country. 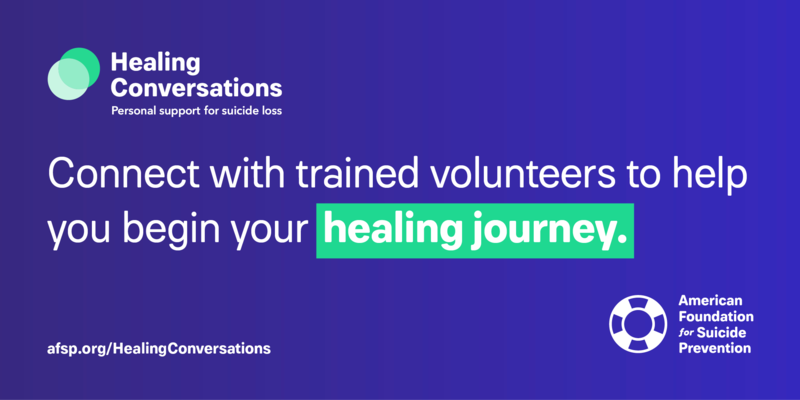 Healing Conversations gives those who have lost someone to suicide the opportunity to talk with our experienced volunteers to help answer questions and provide understanding of suicide loss. These AFSP volunteers, who are themselves survivors of suicide loss, are available in person, on the phone or by video chat, to offer understanding and guidance in the weeks and months following a suicide death. The volunteers know firsthand the pain associated with this type of loss, and can help provide understanding and empathy, as well as share community resources that may be useful on the road toward healing. We are thrilled to announce that the Survivor Outreach Program is now Healing Conversations. Healing Conversations gives those who have lost someone to suicide the opportunity to talk with experienced volunteers. We hope you love the new name as much as we do. We’ve got some exciting news! We’re thrilled to announce the launch of the new Healing Conversations. Previously known as Survivor Outreach Program, Healing Conversations better reflects this special peer-to-peer support system for suicide loss survivors. As always, thank you for all you do for the suicide loss survivors in your community, and for all those affected by suicide.